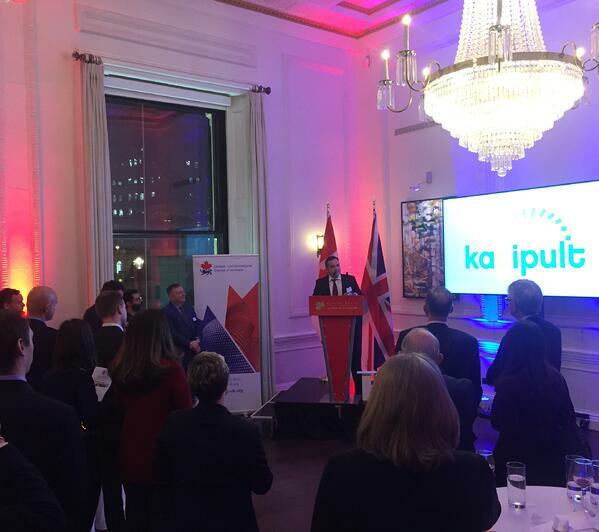 Katipult Technology Corp. (TSXV:FUND - Frankfurt: K10), an industry leading and award-winning fintech company, is honoured to announce its formal inauguration into the UK-Canada Chamber of Commerce. The event was marked with a presentation and a reception at the Canadian Embassy in London at the world famous Canada house. Katipult’s Vice President of Business Development Strategy and Head of EMEA gave a talk regards Katipult’s groundbreaking work in modernising how leading financial institutions can raise capital and fulfil private placements. The UK-Canada Chamber of Commerce has been promoting two-way trade between the UK and Canada since 1921. Katipult’s membership is further recognition of its growing reputation in leading institutions as it joins alongside existing Chamber of Commerce members such as Bank of Montreal, HSBC and CIBC. UK-Canada Chamber of Commerce aims to provide a business networking forum for companies and individuals engaged in trade and commerce involving Canada, the UK and Europe. Consistent with the interests of members, the organization disseminates information on aspects of trade and commerce. Through a variety of events such as seminars and receptions the Chamber offers a business networking opportunity to its members and guests.